I blushingly recall having promised to write this post the day after the previous one. Note to self: just say “later,” never “tomorrow” when talking up future posts. By way of explanation, let me just say that moving house is a little bit like being eaten up by a monster (kraken?) along with all of your belongings, digested, and pooped out the other end. In other words, the less said about the whole thing, the better (I am still being digested, in case you were wondering). So if I can’t write about the mountains of boxes that I am surrounded by, I can at least make good on that promise and finish my Peking duck story. As I mentioned earlier, there are those who like to wrap their duck in pancakes, and that is all well and good, but I prefer a steamed bun. There are lots of recipes out there, because this is a very versatile little carbohydrate. It is very similar to the outside of a bao, if you get my drift. That is to say, it is a bouncy yeasted dough that is steamed to create soft pillows that can be peeled open and stuffed with any number of things. So think of these buns as vehicles for whatever tasty dish you fancy, like super soft pitas. I used a recipe from Fuchsia Dunlop’s amazing cookbook, Every Grain of Rice, which has my mother and me scrambling to try every recipe as fast as we can so we can move on to the next great recipe. …because it’s time to knead! Knead it until the dough is nice and smooth, around 10 minutes. Put it in a bowl, cover, and let it rise for about 20 minutes. Knock the dough back and turn it out on to the counter. Now, you’ll split it into around 32 little balls. 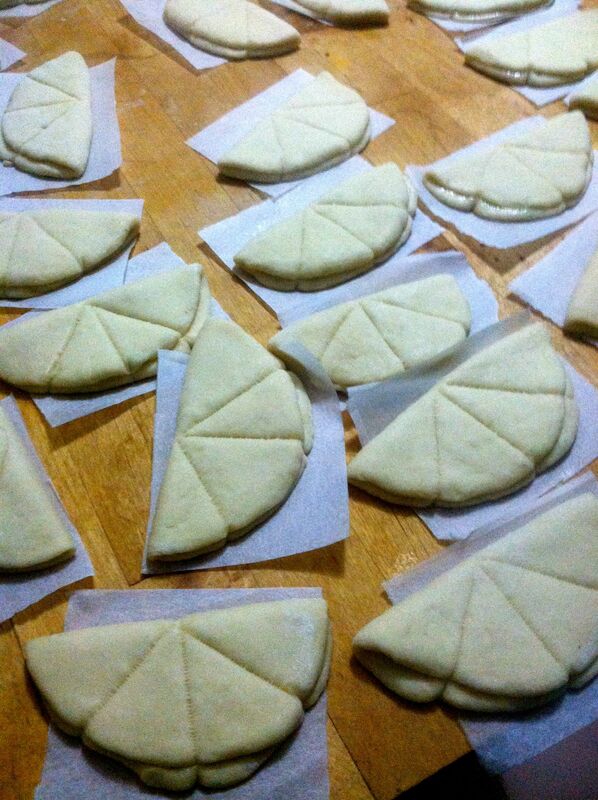 You can do this more easily by quartering the dough and then getting 8 pieces off each quarter. The pieces should be 25 grams, and because I love my kitchen scale, I weighed them. Think what you will. Then let them rise another 20 minutes while you get your steamer ready. 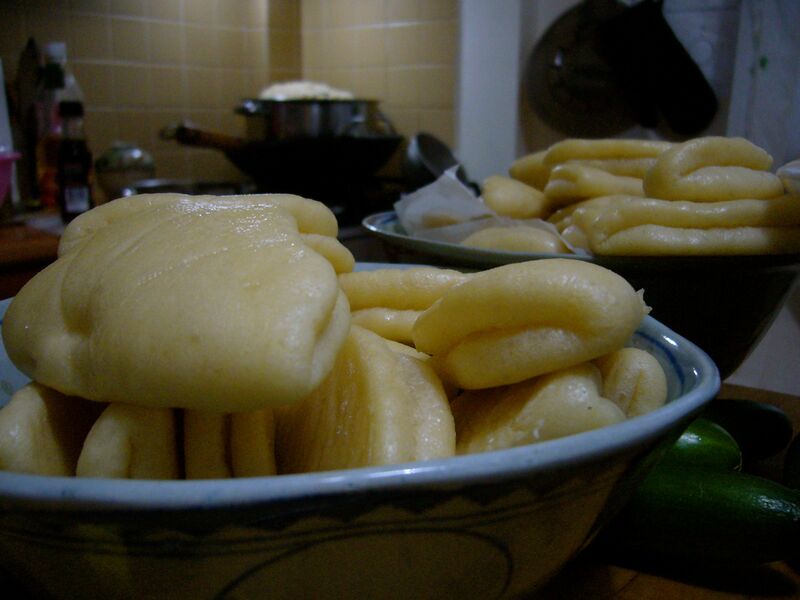 Steam the buns on high heat for 10 minutes. They will balloon! You can eat them right away, or cool them before refrigerating or freezing them. Just steam them to reheat. If this all sounds a bit fiddly, I have to admit that it is. (But I just confessed to weighing each bun.) I did it twice in three days, though, and had fun. Plus, the buns were good, and I had some leftovers for snacking and for Baki’s lunch box. If you are eating these buns with duck, here’s how we do it: first peel the bun open and go ahead and lay on a schmear of Hoisin sauce. Then add a slice of cucumber and a few slivers of green onion. Add your duck skin and your ready for blast off. Mmmmmm…. I love it! I always wondered how to make those buns and your instructions are perfect. Can’t wait to try them! Thanks! Siobhan, it looks so fantastic. Go for the Peking Duck. What a great way to finish off your Mom’s visit. Very tempting – I may have to try this!! I’m not at all familiar with this bread but it sure does look good. Filling it, like you did, with duck, hoisin sauce, and cucumber really does sound like a great sandwich, perfect for lunch. Great, too, that they can be frozen for later use. I too prefer the lotus leaf buns to the Chinese pancakes when eating Peking duck. Your buns look perfect. I sometimes use sesame oil for brushing to give it that extra flavor. Your instructions are very clear and easy to follow. Sesame oil is such a great idea — I will definitely try that the next time I make these. What a lovely post about how to prepare the little buns. I’m sure they are terrific filled with the duck and other goodies. They are a lovely thing to have at table, and very friendly feeling. I liked making them almost as much as eating them. They look so yummy! My mum used to make these a lot when I was growing up, and wow was I spoilt because I remember I used to say I didn’t like steamed man-tou or bao-ze or won-ton, I wanted my favourite boiled or fried jiao-ze (i’m probably screwing up the pinyin here) or the dumpling skin soup. But now I’d kill for any of them! Also I love that spicy bean paste, it’s so good just with noodles too! Also the chilli marinated oily bamboo shoots, I used to just go through that with rice, and my favourite chilli in a jar was Lao Gan Ma! I hate moving too! It always makes me feel so guilty/ annoyed for having so many belongings. But I sometimes like the new places I move into. Or more, I generally like the new places other people move into :p I also hate place-hunting! I’m trying to figure out a place to live in Sydney because university is going to start again in March, and somehow it’s so difficult to figure out where to live! You’ve made me crave about ten things at once and have inspired me to make shui jiao for Chinese new year this Sunday. Happy year of the snake! And best of luck with finding somewhere to live. I always swear that I will stay put after I move, but it never seems to happen. Anyway, maybe this time you’ll be the one to find that great place.